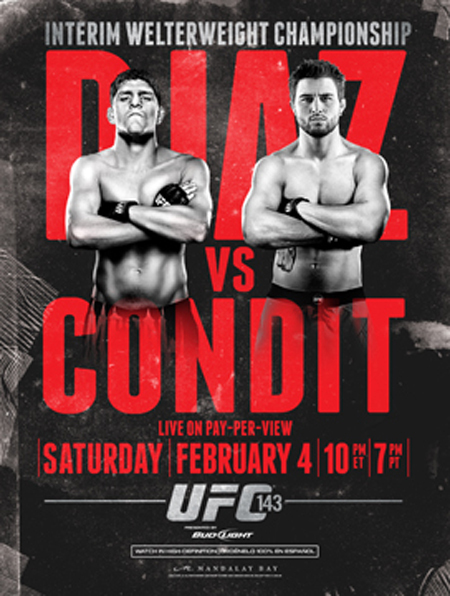 It’s been well established that an interim welterweight title tilt between Nick Diaz and Carlos Condit will headline UFC 143 – please see the official event poster above. However, the four other featured fights airing live during the pay-per-view broadcast haven’t been announced until now. A heavyweight rumble with Roy Nelson and Fabricio Werdum will serve as the night’s co-main event. The Mandalay Bay Events Center in Las Vegas, Nevada hosts the February 4th festivities. Although officials have yet to confirm, FX is expected to air all of the card’s preliminary bouts. The PPV broadcast begins live immediately after the freebie fights at 10PM ET/7PM PT.